Richard Engel talking to Charlie Tillinghast, the president of MSNBC.com. 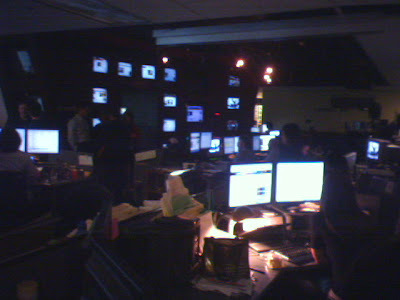 It's dark in the newsroom, you can hardly see them. Richard Engel in the field. 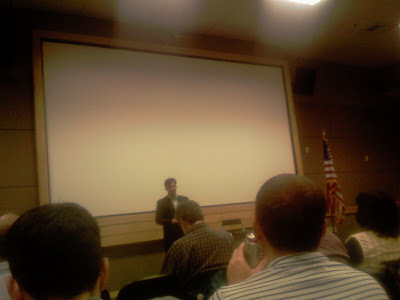 Richard Engel speaking to Microsoft employees. NBC News Chief Foreign Corespondent Richard Engel came and spoke to Microsoft and MSNBC.com yesterday. He has lived in the Middle East for 12 years, in Iraq for the past five. Let me repeat that; the man decided to live in Iraq for the last five years, from 2003 through today. He only recently moved to Beirut when he was named chief foreign correspondent, and not just chief correspondent for the Middle East. If this all sounds crazy, then you might get an idea of what kind of guy he is. He doesn't seem crazy to meet him, but to put yourself in danger's way like he has, it makes people wonder. It makes me wonder, at least. He first got into Iraq with a visa as a human shield, i.e., the Iraqi government let him into the country because he promised to strap himself to a powerplant so America wouldn't bomb it. He didn't actually follow through with that promise, but still. Pretty brazen. He spoke about the war. He said to call it the war is a misnomer. There is no single Iraq war, there have been several wars, at least five. America invades, Shock and Awe, Saddam is toppled. Looting, happy chaos, people excited to be liberated, but not sure what happens next. Disbelief, confusion, U.S. rushing to assemble new government, Iraqi people still dazed. 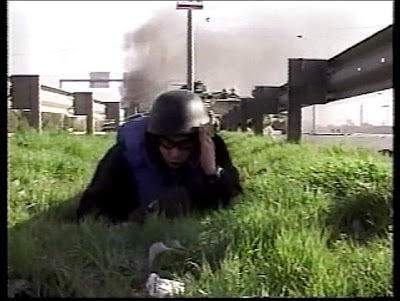 Beginning April 2004, the Insurgency. Disnefranchized Sunnis violently revolt, along with former Baathist military who had been the elite of society and were now relegated to begging. Those, along with an organized foreign extremist force galvanized what would become the Insurgency. General Petraeus takes over, initiates new policies of cooperation with Iraqi forces, the surge starts, violence drops dramatically. Now it's a matter of building up a self sustaining governmental infrastructure, and withdrawing American forces. That's what we face now. Engel was selling his books, both of them war diaries. I bought them both, had him sign them. Hope I can find time to actually read them now. A lot of what he said is summed up in the videos below. Fascinating, hope you like it as much as I did. I can't believe you actually got to meet Richard Engel. That's incredible. I really want to read his book now. Clearly the man is missing a few marbles, and lives off the crazy-high adrenalin rush that comes from doing things like lying to middle-eastern governments.